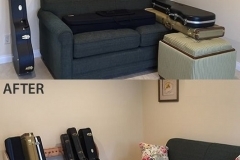 Here are just some of the many photos that we receive from our happy customers with their guitar storage racks and stands and wall mounted displays. As you can see, our customers use our products in a wide variety of rooms – from dens, to living rooms, bedrooms and home music studios. Versatility, practicality, and beauty combined into one product!